Analysts might have termed the Budget 2005-06 as ‘insipid’, but the industry here is happy with it and said it was growth oriented. However, the imposition of 0.01 per cent of tax on cash withdrawals of Rs 10,000 or more per day from banks, in the industry as well as common man was termed as irrational and illogical step. Confusion prevails among residents over the preparation of birth and death certificates in the district as two offices of Registrars, Birth and Death, are working in the city in violation of the Registration of Birth and Death Act, 1969. In a bid to put the state on the fast track of development and prosperity, the government has chalked out a plan to execute a number of power projects at an estimated cost of Rs 10,000 crore during the next two years. This will enhance the power generation capacity by around 2,000 MW. Increase in Income tax exemption limit for individuals, women and senior citizens and reduction in prices of commodities like LPG and tea have been welcomed by city residents. “Increase in exemption limit is a relief for individuals. It would also ensure compliance,” said an Income Tax and sales tax consultant. Four robbers looted Rs 3.12 lakh from a Finance company in the Feroze Gandhi market here in daylight today. It caused panic among traders and commercial establishments owners. It was an evening of harmony and peace with the ‘Guru of Joy’, Sri Sri Ravi Shankar Harmonious notes were struck during a lecture organised in the sprawling campus of the Government College for Women, here yesterday. The founder of the Art of Living Foundation remains mild and unassuming, making everybody feel comfortable. He spelt out the mission of life for everyone. The Deputy High Commissioner of the Canadian Embassy, Mr Brian Decson has called upon the social organisations of the state to join hands with the NRIs living in Canada who, according to him, were interested to lift the standard of living of the areas they originated from. The development works started by the previous SAD-BJP government in the Koomkalan segment have come to a halt. The 66 KVA grid sub-station of Hedon Bet whose foundation stone was laid by the then Speaker of the Punjab Vidhan Sabha, is lying incomplete. The building of this Rs 4 crore project is ready for the past four years. Annual calendar of Municipal Sanitary Inspectors Association, Punjab was released by Commissioner of Ludhiana Municipal Corporation, S.K. Sharma for a function by the association here today. Mr S.K. 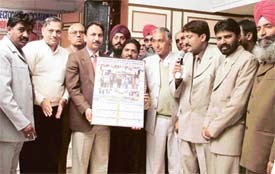 Sharma, Commissioner, Municipal Corporation, releases a calendar of the Municipal Sanitary Inspectors Association in Ludhiana on Monday. — Photo by I.V. The Northern Railway has announced to introduce a train between Amritsar and Hisar from tomorrow. Railway sources said here this evening that the 1ALH train would leave Hisar on March 1 at 10.30 pm and reach Ludhiana at 4.50 next morning and would proceed for Amritsar at 6.05 a.m. to reach Amritsar at 9.30 a.m. The Government Railway Police Punjab, shockingly, does not view the looting of eight passengers and the killing of one of them on board the Jalandhar-New Delhi Super Fast train near Jaspalon village on Saturday as a dacoity or even at least a robbery incident. 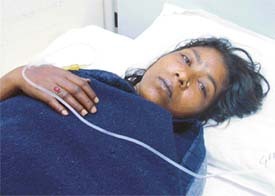 The Sarabha Nagar police today booked three persons allegedly for beating up a maidservant. She was suspected to stealing some valuable from a household in Parkash Colony, Raghunath Enclave here. Robbers struck at the house of a hosiery trader in Gandhi Nagar here yesterday late evening and looted Rs 4 lakhs at gun point. They tied the trader’s son with ropes and decamped with cash and jewellery worth over Rs 4 lakh. The police, here, has claimed to have arrested three persons for stealing a gun, cash and gold two years ago from Rohno village. The Court of Mr K.K. Goel has sent all the accused to judicial custody. Mr Hari Lal of Lucknow, while going on a cycle on the GT Road near Bhanor was hit by an unidentified vehicle and killed on the spot. The Dakha police has registered a case under Section 304A of the IPC on the statement of Kewal Kumar of Grain market Mullanpur. Driver fled the scene. The Joint Action Committee (JAC) of employees and teachers of Punjab Agricultural University (PAU) has expressed resentment over denial of two advance increments to those teachers who had acquired Ph.D. degree in service prior to January1, 1996, and terming it as an act of discrimination. Under country’s 9th and 10th higher education plan, the University Grant Commission (UGC) has decided to identify over 155 colleges in the country to be given ‘potential in excellence’ status. Under the scheme, the colleges would be allotted with special funding schemes. The preliminary screening has already taken place with the short listing of more than a dozen colleges from all over the state. Six colleges from the state would be chosen for this special status. The Spring Dew school was established at Nanaksar (Jagraon) in May 1999 to provide good education to students in and around Jagraon. After the untimely death of the first Principal Sunita Arora, Mrs Anita Kalra. took over as the Principal of the school. TO make the teaching and the learning processes more meaningful and enjoyable, the teachers of my school follow activity-based teaching that includes dramatisation, role play, experimentation, etc. Sapling Nursery School — Rajguru Nagar celebrated its annual day here yesterday. 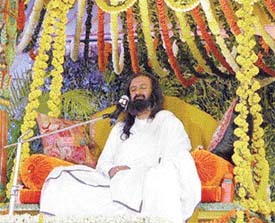 Theme of the function was ‘Festival of India’. 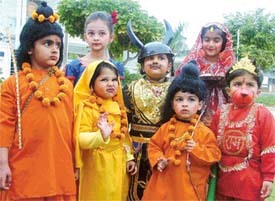 Children were dressed up in beautiful costumes. Shooting for next episode of serial ‘Virasat’ being telecast by Jalandhar doordarshan was completed at Udalpur village, 8 km from here. Serial is being produced and directed by Baljeet Singh. Ludhiana, industrial capital of Punjab, is fast emerging as major destination for medical tourists from overseas, both NRIs and those of foreign origin, who want to combine sight-seeing with knowledge of culture, as also for the modern medical treatment and major surgeries. A hospital organised a district-level “healthy baby contest” at Sahjad village near here yesterday. Parents of over 50 babies participated in the programme, arranged with the cooperation of village sarpanch Ms Jaswant Kaur and former sarpanch Mr Surinder Singh. The Sanjeevani Ayurvedic Centre, a speciality ayurvedic clinic, here, launched an OPD wing in ayurvedic gynaecology for the first time in the city. Making this announcement in a news conference here today, Dr Anshu Vatsyayan, a well known ayurveda practitioner with over two decades of experience, said ayurveda was the oldest but the most documented medical system in the world. Dr Rajesh Chand Arya, consultant cardiac anesthesiologist at the Hero DMC Heart Institute here, has been awarded the prestigious travelling fellowship for 2005-2006 by the Indian Association of Cardiovascular and Thoracic Anesthetists (IACTA). Manmeet Grewal a B.Com final year student of Guru Nanak National College, Doraha, has broken national record for men in 90 kg to 100 kg category at the VII Senior Strength Building Championship held at Chennai. 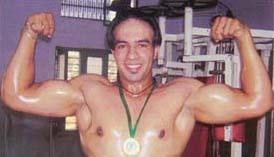 He recorded total 180 kg in the events of press behind the neck that was 102.5 kg and bicep curls in steady motion was 77.5 kg. BBF XI routed FTI Club by eight wickets to register their second win the 12th Veera Devi and 2nd Madan Lal Memorial Cricket Tournament being played at the Tajpur Road ground here yesterday. 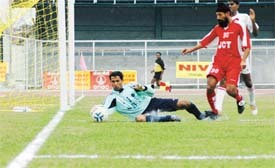 Harjeet scored 44 runs and Ashu took four wickets for 15 runs as the Unique Club recorded a comfortable six-wicket win over the Municipal Corporation Club in the ongoing cricket tournament being played at the Satish Chander Dhawan Government College ground here yesterday.